A workshop was successfully organized on 11th April 2018 at T02, Faculty of Biosciences and Medical Engineering (FBME), UTM by a research team involved in Southeast Asia Small Scale Research Partnerships-Newton-Ungku Omar Fund (UK-SEA-NUOF), known as Newton Fund in short. The research project under this fund is an international collaboration between United Kingdom and Malaysia, led by Professor Neil Bruce (University of York, United Kingdom) and Dr. Chong Chun Shiong (FBME, UTM), starting March 2017 with the research title: Sustainable production of compost, biofuels and chemicals from oil palm residues. The purposes of this workshop are to update the current progress of the project and to discuss the possibilities of future research. Professor Neil Bruce had made his third visit to UTM for these purposes. 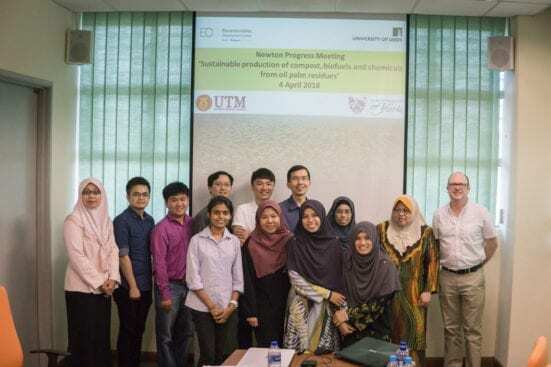 Postgraduate students involved in this project, including Mr. Lam Ming Quan (Supervisor: Dr. Chong Chun Shiong), Ms. Nurshafika Abd Khalid (Supervisor: Dr. Adibah Yahya), Ms. Siti Fatimah Jamaludin and Ms. Nurul Aida Nabila (Supervisors: Assoc. Prof. Dr. Madihah Md Salleh & Prof. Datin. Dr. Zaharah Ibrahim), Ms. Sharvini Siva Raman (Supervisor: Assoc. Prof. Dr. Zainura Zainon Noor), Mr. Liew Kok Jun and Mr. Teo Seng Chong (Supervisor: Dr. Goh Kian Mau) presented their progress of this project in front of the researchers from both UK and Malaysia sides. This workshop also promoted knowledge exchange between Malaysia and UK, to widen the horizon from both sides. Previously, two similar workshops were organized at Hotel Jen, Puteri Harbour, Johor on March and August 2017 respectively. Professor Neil Bruce is a Professor at Centre of Novel and Agricultural Products (CNAP), Department of Biology, University of York, UK. His areas of expertise are environmental biotechnology and microbial biochemistry. He will make his next visit on this coming August, as a plenary speaker of the Asian Federation of Biotechnology Malaysia Chapter International Symposium (AFOBMCIS) 2018 in Sarawak. The research team would like to take this opportunity to express their gratitude to all the UTM staffs and students involved in this workshop.